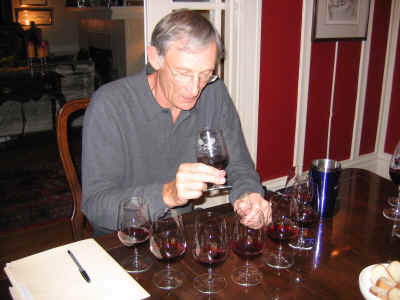 Since we had recently tasted a set of Pinot Noirs from Santa Barbara County, host Mark Naismith opted to have a set of Sonoma County Pinot Noirs. 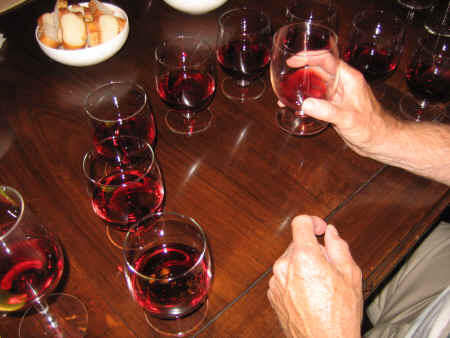 The wines came from the 2006 and 2007 vintages. 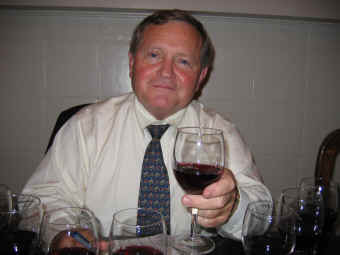 We included wines from a number of fledgling brands with two relative "old timers" (Schug and Judy Jordan's "J" winery). The overall quality of the wines was good and virtually all of them leaned in the direction of Pinot Noir (as opposed to Cabernet or Syrah). Two wines were well ahead of the pack and the second place finisher would have been our top wine had not one taster found it to be disagreeable. Our last place wine was quite drinkable, certainly, but it was far less complex than the other 7 bottlings. Light garnet in color, this would have been better suited to a tasting of Beaujolais wines than it was in a parade of Pinot Noirs. It's youthful, fruity and shows strawberry notes reminiscent of good Gamay. No stars on my three star scale, meaning it's a rather average quality wine in this setting...Were we tasting Beaujolais, I'd give it a one star rating. 7th Place: TR ELLIOTT 2006 Russian River PINOT NOIR "Three Plumes"
Light garnet in color, this wine offers lightly berryish fruit aromas with a cherry note and a touch of wood. I rather liked the nose of this. It's dry on the palate and medium bodied, but it was less exciting on the palate. The wine is mildly astringent and shows a riper fruit character....I gave it a half-star rating. Garnet in color, this wine has a range of fragrances, including a minty, woodsy aspect and a fruit tone reminiscent of watermelon. It's dry and medium bodied. I found it to be a bit tight and lean, with mild tannins. It may unfold with some cellaring and achieve a higher ground in time. I pegged it as a half-star wine presently. Light cherry red in color, this Pinot shows strawberry fruit aromas and a touch of smokiness on the nose. It's certainly varietally correct and is light to medium-bodied. There's a touch of tannin and light fruit on the palate...perfectly pleasant, but not profound. One star. I had tasted a few bottlings from this new winery and thought they were of interest. This started out well, but as it aired, the wine became a bit more pungent and showed a ripe element which, for me, was ultimately too jammy. The wine is fuller-bodied than most of the field, but its ripe elements cause it to lose a bit of varietal character. Finally, I decided it was too atypical and ranked it as my last place wine. No stars. Light garnet in color, this shows nicely cherryish fruit with just a hint of wood in the background. It's medium-light in body and dry. There's a lightly tannic aspect here which is certainly within the realm of being balanced. Nice wine, though not a profound blockbuster. One star. 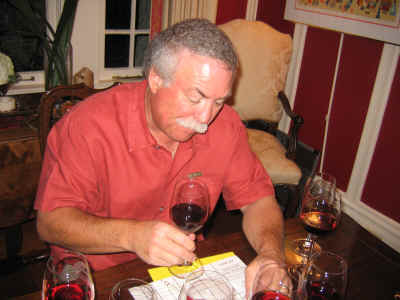 With light garnet color, I was surprised this wine fared as well as it did on most scorecards. 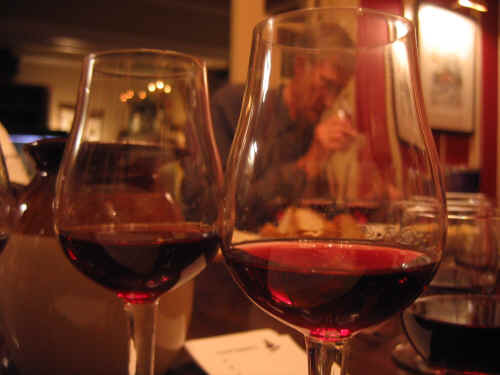 The aromas are more reminiscent of a soulful French Burgundy than they are New World Pinot Noir. We found some vegetal and herbal tones on the nose, with a forest floor fragrance. Hints of mushrooms are evident, also. It's a particular wine and I figured people will either be enthralled or repulsed. One taster, in fact, ranked it last finding it quite unpleasant on the nose. I found this dry and medium-full in body. The vegetal, herbal qualities are evident on the palate, with some ripe, sweet cherry overtones. I gave this a two star rating and it might be worthy of a half a star more. Showing the color of a fairly dark ros� wine, this new winery has a Pinot showing typical cherry-like fruit, backed by a vanillin quality from its maturation in wood. Sweetly fragrant. Dry on the palate. Medium bodied. Plenty of varietal character and charm, with sweet cherry fruit and vanillin flavors. Probably the Smith wine (above) is the more complex and profound bottle, but this wine hits all the right notes and sells for a sensible price. Two stars.